With the advent of laser technology in the 1960s, materials scientists gained a new tool to both study and modify materials. Today, lasers allow researchers to manipulate materials on atomic and subatomic levels, leading to new materials and a host of other applications. For instance, by controlling laser wavelength, intensity, and pulse duration, researchers can modify metals to exhibit useful new properties for a broad range of applications. Until recent years, researchers relied on experimental trial and error to achieve the desired properties, but in the era of supercomputing, experiments can be done in a virtual laboratory. University of Virginia professor Leonid Zhigilei led a team that made such a virtual laboratory by using computing resources at the Oak Ridge Leadership Computing Facility (OLCF), a US Department of Energy (DOE) Office of Science User Facility located at DOE's Oak Ridge National Laboratory. The team used the OLCF's Titan supercomputer to gain deeper insights into laser interactions with metal surfaces. "Rapid expansion of practical applications of ultrashort pulse laser processing, including engineering of new materials, requires understanding of fundamental mechanisms of laser induced structural and phase transformations," Zhigilei said. "Experimental probing of these transformations, which take place on the picosecond time scale (one-trillionth of a second), is difficult, expensive, and often not even feasible. Performing 'virtual experiments' on a supercomputer provides an attractive alternative. "Moreover, computational results may guide focused experimental exploration of the most promising irradiation regimes or interesting phenomena predicted in the simulations," he said. By using a combination of virtual and real-world experiments, the team is gaining a fundamental understanding of the mechanisms for material interactions induced by lasers. The term laser is actually an acronym for light amplification by stimulated emission of radiation. The visible light that we see in our daily lives is electromagnetic radiation—energy—that falls within a wavelength our eyes can perceive. Atoms must be excited to release their light-emitting energy, though, and lasers harness these atoms' energy into beams. These beams are a collection of coherent light waves. The amount of energy they carry, however, can vary widely, and both low-energy and high-energy lasers have made huge impacts on modern life. Low-energy lasers helped usher in the era of CDs and DVDs, whereas high-energy lasers have simplified countless medical procedures and enabled a wide range of material design applications. The latter of these requires precision and a detailed understanding of how lasers interact with a material on the nanoscale. Zhigilei noted that his team has focused on understanding the ultrafast phase transitions triggered by laser irradiation, or the pathways the material takes to go from one state of matter to another, such as ice melting and becoming water. If a heat source hits an ice cube, for instance, it begins melting at the heating point. Heat then transfers to the colder regions behind, melting the whole cube essentially from front to back. The intense energy of lasers, though, makes it possible for that same ice cube to melt from the inside or melt in various regions simultaneously. In the case of an ice cube, the entire solid ultimately turns to water, but when researchers are trying to catalog metallic surface changes at the nanoscale, the picture becomes more complex. Understanding the details of these phase transitions is essential for predicting material properties that may be of interest for practical applications. Zhigilei's team uses supercomputers to simulate these phase transformations at atomic scales. To create meaningful simulations, though, the team needs to simulate millions or, in some cases, billions of atoms. They can then watch how atoms move over a sequence of very brief moments in time called time steps. By running long simulations consisting of millions of time steps, researchers may be able to observe all the processes happening during a laser–metal interaction during a total time of several nanoseconds (each nanosecond is one-billionth of a second). The team recently ran a 2.8 billion-atom simulation of silver for 3.2 nanoseconds, allowing it to compare for the first time the frozen surface's morphology—its surface structure—to experimental data. Lasers can imbue metals with many novel properties. One way to do this is to use laser ablation, or the process of selectively removing small amounts of material, thus changing the surface morphology and microstructure. While often invisible to the human eye, this process can make major changes to a metal's characteristics. Laser ablation irradiates the surface of metal in a quick, violent interaction, creating very tiny explosions of particles being removed from the material. As the metal cools, it exhibits new properties, depending on the process. Engineers can use lasers to influence how a metal surface interacts with water—forcing water to roll off the surface in a certain direction, for instance. Researchers can create black surfaces on metals without using paint or other synthetic materials. Short laser pulses can also locally modify the hardness of metals; for increased flexibility, engineers can make a hard outer shell of a metal sample while keeping the inside softer. In many cases, metal processing occurs in a vacuum, thus allowing engineers to prevent contaminants from getting into the processed material. Though the Zhigilei team focused primarily on simulating metal–laser interactions in a vacuum, the computing time awarded through the Innovative and Novel Computational Impact on Theory and Experiment (INCITE) program allowed the team to simulate these processes in more complex scenarios, as well. "Laser ablation in liquids, in particular, is actively used for generation of clean colloidal nanoparticles [nanoparticles that are insoluble and evenly dispersed in a solvent] with unique shapes and functionalities suitable for applications in various fields, including biomedicine, chemical catalysis, and plasmonics," said team member and University of Virginia graduate student Cheng-Yu Shih. "While, experimentally, the liquid environment has been demonstrated to strongly affect the nanoparticle size distributions and microstructure of laser-modified surfaces, the physical mechanisms of laser surface modification and ablation in liquids are still poorly understood. The interaction of the ablation plume [a cloud of metal vapor and small droplets ejected from the irradiated target] with the liquid environment adds an additional layer of complexity to the laser ablation. Atomistic simulations help shed light on the initial, very critical stage of ablation plume and liquid interaction and predict the subsequent nanoparticle formation mechanisms at the atomic level. With access to the INCITE resources, it becomes possible to address the challenging problem of atomistic modeling of nanoparticle generation by laser ablation in liquids," Shih continued. The team's ability to expand its simulations came from equipping its code to use accelerators like Titan's GPUs. During the course of its INCITE project, the team worked with OLCF scientific computing liaison Mark Berrill and OLCF user support staff to improve hybrid code performance. As a result, the team was able to achieve a sevenfold speedup over CPU-only methods. These speedups helped the team run larger, more complex simulations and expand the study into the simulations of metal processing outside of a vacuum. In addition, OLCF staff helped the team optimize its codes' I/O performance by implementing the Adaptive I/O System (ADIOS) middleware into the code. The team also worked with OLCF computer scientist Benjamin Hernandez to help with visualization of atomic configurations that consist of billions of atoms. The team attributes a variety of computational resources to its success. "With a highly optimized computer code that runs in parallel on thousands of computer nodes and fully utilizes the capabilities of modern computing technology, including low latency and high bandwidth interconnects between the nodes and high performance GPU accelerators, it is now possible to address the most ambitious and incredibly challenging computational problems in our field," said team member and University of Virginia graduate student Maxim Shugaev. 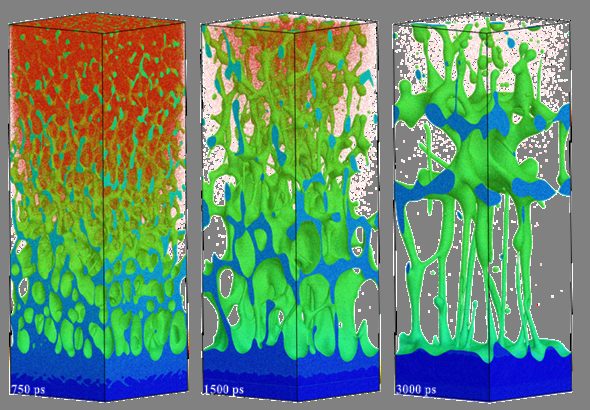 Moving into the next year of its INCITE award, the team plans to focus on laser–metal interactions in liquids to gain a complete picture of how surface tension, critical temperature, pressure, and differing environments control metal surface morphology and microstructure. More information: M. V. Shugaev, C. Wu, O. Armbruster, A. Naghilou, N. Brouwer, D. S. Ivanov, T. J.-Y. Derrien, N. M. Bulgakova, W. Kautek, B. Rethfeld, and L. V. Zhigilei, "Fundamentals of Ultrafast Laser–Material Interaction." MRS Bulletin 41, no. 12 (2016): 960–968.